This post is updated with revisions and listening notes. Some weeks ago, I mentioned that I’d be posting up drafts of each movement’s programme note for Mahler’s Third Symphony, ahead of our performance on Saturday 20th October (tickets available on the right, if you’re reading this before that date!). As it turns out, it’s been easier to draft the whole thing, though as referenced below, I’ll be adding more-detailed ‘listening notes’, in due course. Whether you’re a musician, potential audience member or just an interesting passer-by, I’d be interested in your comments. Indeed, if you make them before the print deadline, they might influence the printed version. Having assigned more than one ‘programme’, or at least movement titles, to this and other symphonies, Mahler subsequently withdrew them. Conductor, Bernard Haitink, who I’ve had the pleasure of watching conduct this symphony, said before a Proms performance a couple of years ago that this was ‘a very wise decision’. So it might seem strange that we’ve nicknamed this concert, ‘What Mahler Tells Me’ – a reference to the fact that the original movement titles that Bernard Haitink was glad were withdrawn all take the form of ‘What x tells me’, except the first movement. Personally, I still think these titles are useful for guiding the uninitiated in understanding what Mahler was trying to say. Regardless, I want you, the listener, to have a choice. If you’re reading this and you don’t already know the symphony then you’ve already opted to go beyond the ‘pure’ experience of just hearing the music and seeing what reaction it provokes in you. That’s a very valid way of hearing a work for the first time and was the way I first heard it. But my understanding and enjoyment of the symphony increased on acquiring more information about it before subsequent listenings, much like the enjoyment of a fine wine can sometimes be increased by reading the tasting notes. If that’s what you want, read on! And if you feel further guidance will help shape what Mahler tells you through his music, I’ve expanded into some ‘listening notes’ which include the composer’s withdrawn subtitles, below. 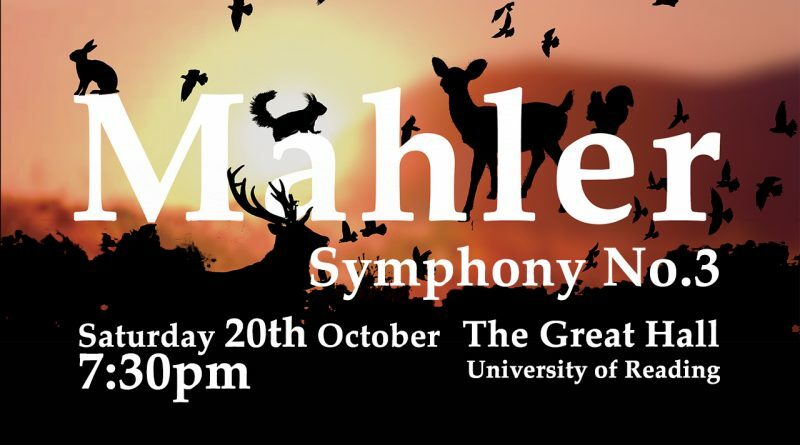 Mahler’s music is infused by the influences of his childhood, and his deep love and desire to realise the power of nature in musical form. As a child he grew up in a provincial garrison town in Bohemia, which at the time was part of the Austrian empire. A combination of street songs, military marches and fanfares permeates his writing, along with a deep melancholy from having experienced the frequent loss of his fourteen siblings during his childhood (five died during infancy, whilst three others did not live to mature adulthood) and from the sense of being an outsider as a Jew – something that was to follow him through his adult life, despite his immense musical achievements. The Third Symphony was composed in Mahler’s purpose-built studio on the banks of the Attersee (Lake Atter) in Austria, where he could look out over the rustic, mountainous scene and absorb it into his music. Even by Mahler’s standards, this symphony is of an epic scale, requiring a large orchestra and two choirs (tonight’s performance will have just short of 140 performers). The first movement alone is around 33 minutes long and will be followed tonight by a short interval. It comprises two principal contrasting ideas: that of a monumental and, at times, daunting force, contrasted with more positive music breathlessly marching in to sweep aside doubt. Both inspire awe in different ways, and both are infused with the influences described above. The second part of the symphony (after the interval) comprises the remaining five movements. The second movement is more tender than the first, with moments of sprightliness sometimes bordering on mania. The third movement calls upon the sounds of the forest, interspersed with a distant ‘posthorn’ solo (actually played on a flugelhorn) which tonight’s first (French) horn, Tom Brett, told us the background of in rehearsal: each postillion (post-coach driver) would have his own distinctive posthorn call (so that people would know in advance which coach was about to arrive, in the days before firm timetables!) and there was a degree of rivalry in producing the most beautiful call. The posthorn melody in this symphony is reminiscent of the Austrian folk song ‘Ich bin der Altausseer Postillion’ whose first verse can be roughly translated as “I am the postillion from Altaussee/ when people hear me they know straight away that it’s me/ My coach and horses are second to none in the land/ therefore I blow my signal bright and clear”. Movements 4-6 follow each other without a break. Our soloist, Harriet Kirk, joins us on stage for the fourth movement’s setting of part of Nietzsche’s Also sprach Zarathrustra (the text and translation are below): a hushed metaphysical meditation on humankind, both mysterious and yearning. In the fifth movement, Mahler returns to his favourite collection of German folk poetry, Des Knaben Wunderhorn (clumsily translated as ‘Youth’s Magic Horn’), which he delved into in the Second Symphony. The children’s voices mimic bell tones (‘Bimm! Bamm!’), while a three-part women’s choir sings of Jesus (whose words, sung by the mezzo soprano soloist, are Mahler’s own additions to the text) imploring his disciples to join him in repenting of their sins and having faith in God’s forgiveness. From this brief, cheerful interlude, the last movement unfolds. Music of great tenderness builds steadily, erupting into passionate outbursts, disintegrating into moments of crisis several times, before surrounding everyone in the room with a sonorous, uplifting conclusion. The first movement was titled, ‘Pan awakes: Summer marches in’. Indeed, the Greek god Pan’s name was to be the title of the whole symphony, before Mahler changed it to ‘The Happy Science’ after a text of Nietzsche’s. All the titles were withdrawn, of course, but they give the listener a window into Mahler’s inspiration. Clearly, the central theme is nature. Pan is thought of as the Greek god of nature, capable of huge feats of strength and transcendence. The symphony opens with an appropriately-powerful statement from all 8 horns, which the orchestra responds to almost by standing to attention. The music quickly subdues into a darker place, with a bass drum tapping out a quiet, steady heartbeat, which is taken up by the trombones. Here is, perhaps, the sleeping Pan. Trumpets sound ominous muted fanfares, whilst woodwind and horns leap upwards in yawning octaves. Upper strings sizzle with dramatic tremolando, whilst the lower strings burst out with furious scales from the depths. Out of this burst the horns, now playing a terrifyingly portentous theme, which perhaps signifies Pan’s awakening. A solo trumpet tries to calm everything down, and eventually the music subsides back down to the solo bass drum. A new theme breathes in on the woodwind, accompanied by fluttering trills in the upper strings. This is clearly another awakening, and it builds quietly from the basses before being suddenly brought to life by alarm-like squawks from the high clarinets, reminiscent of some of the animal-like calls to be heard later in this and the third movements. Suddenly, the music is scurrying around, and there is a brief hint of the march to come, both in terms of its main theme, briefly exposed on the solo oboe and violin, and in the hushed appearance of percussion. Returning to the trombone and bass drum heartbeat, the first of three major trombone solos in this movement is heard, calling out over a great valley, perhaps. It’s almost like the god Pan is stretching and yawning, but not in a gentle way! The other trombones join as the music becomes more animated, before we are briefly plunged back into the darkness of the opening music. This precedes the build of the ‘Summer’ march in earnest. Distant fanfares and the rustle of a gentle snare drum add to the sense of anticipation. The horns briefly introduce a happy, gentler version of the theme heard at the very beginning of the symphony, preceding the quiet introduction of the main march theme which builds boisterously. The two themes interact gleefully, egging each other on. Suddenly, the music is interrupted by a blinding flash of light, signalled by the harps swooping upward glissandi. As the music ascends, the horns return with the awesome theme they had near the beginning, with all its terrifying intensity. The music seems to briefly break down into complete chaos, before the solo trombone returns, this time much more consolatory in tone. The calming effect is complete when the horns’ terrifying theme is lowered to a nervous, almost apologetic cor anglais. From here, the music takes on an ethereal quality. It’s almost as if nature’s excitement has made Pan angry and all life is now quivering. The fact that Mahler marks the harp part ‘Mediator’ supports this. The solo horn and violin spin a beautiful duet and all returns to peacefulness. Rude interjections low down in the lower string instruments and trombones give a clue that nature is still stirring, and indeed after some fast murmurings in the cellos and basses, the march explodes again, even more frenzied than before. The pace increases relentlessly, with the instruments almost dancing into delirium, before the music dies away. Off-stage snare drums, playing at the original tempo, hint that the march has not gone away for good! The offstage drums are followed by a brief recap of the very opening music from the symphony, slightly-altered. For the final time, the solo trombone returns, assertively at first, then once again consolingly. For the final time in the movement, the music calms to silence, only for the cellos and basses to stir, tentatively, guiding us quietly into another building march. The movement ends with another flash of blinding light, but this time the excitement of ‘summer marching in’ cannot be suppressed, and the movement whips into a wild conclusion. Mahler titled this movement, ‘What the flowers in the meadow tell me’. Right from the start, where a low oboe presents a gentle, flowing melody in 3, like a minuet or waltz, the music is less intense than the monumental movement that preceded it. There’s a sense of warmth and tenderness as the gently-dotted theme is passed around the orchestra, with varying combinations of instruments adding different colours. Then, out of nowhere, we are thrust into something more playful, with lines scurrying around each other. The two sections are repeated in varied form, before the movement winds down. The coda at the end of the movement sees the violins sleepily intone a version of the horns’ ‘terrifying’ theme from the first movement, though it is heavily disguised. Mahler titled this movement, ‘What the animals of the forest tell me’. The language of the movement is typically bucolic, starting with little animal calls over a bed of plucked strings. The texture is wafer-thin and fragile until a sudden contrast with rumbustiously-loud music, similarly high-spirited, taking hold. These contrasting episodes continue until the music calms completely and the distant sounds of a posthorn (played offstage – tonight on a flugelhorn) are heard with the thinnest of accompaniments from the orchestra, and joined eventually by a tender horn duet. The posthorn interludes are interspersed with more playful music, though this time more anxious and sometimes melancholic. Eventually, the chill wind disappears and the music resumes its frolicking nature. A final episode of posthorn calmness precedes an altogether more urgent awakening of the ‘creatures’, in anticipation of something out of the ordinary, and it comes with another blinding crash. Perhaps in a flashback to the first movement, the horns and trombones solemnly declare a theme based on the intervals of octaves and perfect 4ths/5ths – a reference to the Pan music’s texture of the first movement, interspersed with some of the natural brass intervals heard in the posthorn music. The movement ends with fanfares and a bang! The final three movements follow without significant breaks between them. After the excited scurrying of the woodland animals, the 9-minute fourth movement is a complete contrast, with a mystical, hushed feeling throughout. It is a setting of part of Nietzsche’s Also sprach Zarathustra (the text and translation is below), where humankind is urged to ‘take heed’ and listen to what the ‘deep midnight’ says. Mahler titled this movement, ‘What (Hu)mankind tells me’. There are two basic musical ideas. The relatively-static opening begins with the lower strings oscillating barely audibly, developing into a sombre chorale that was first heard early in the first movement. The accompaniment consists of very high or very low chords over a bass drone. Occasionally, a lone oboe or cor anglais plaintively sings a rising minor third, which Mahler instructs to be played, ‘Wie ein Naturlaut’ (literally – ‘Like a sound of nature’). The second idea is more melodic, though still very broad. In the first instance, it is a duet between the violins and pair of horns. When it recurs, towards the end of the movement, its yearning quality suits the words, ‘Doch alle Lust will Ewigkeit!’ (‘But all joy seeks eternity!’), before the movement concludes down in the ‘deep midnight’ from whence it started. Und tiefer, als der Tag gedacht! Tief, tief ist ihr Weh! From deepest dream have I awoken! And deeper than the day had thought! Deep, deep is its suffering! Joy deeper still than deepest woe! But all joy seeks eternity! Titled ‘What the angels tell me’, Mahler sets a text from ‘Des Knaben Wunderhorn’ (a collection of German folk poems clumsily translated as ‘Youth’s Magic Horn’ for a much-reduced orchestra, to accompany a women’s choir and a children’s choir. The children mainly imitate the bells that start the movement with them (‘Bimm! Bamm!’), while the women tell of three angels singing a sweet song to celebrate St. Peter being free from sin. The music here is sprightly and joyful, only interrupted when Jesus (the mezzo soprano soloist) challenges the disciples at The Last Supper, telling them how he has wept bitterly as he has broken the Ten Commandments, that they should have mercy on him (at which point the music turns a shade darker and more menacing, as if to signify the evil spectre of sin) and that if they have sinned they should fall to their knees and pray to God. To reinforce that point, the children join in the dialogue, forcefully, ‘Liebe nur Gott!’ (‘Love only God!’). The ringing of the bells subsides and the texture dissolves to a final ring. Mit Freuden es selig in den Himmel klang. Da sprach der Herr Jesus: Was stehst du den hier? Wenn ich dich anseh’, so weinest du mir. Und sollt’ ich nicht weinen, du gütiger Gott . . .
Du sollst ja nicht weinen! Ach komm und erbarme dich über mich. So wirst du erlangen die himmlische Freud! Die himmlische Freud, die kein Ende mehr hat. There were three angels singing a sweet song ringing joyfully to heaven. They rejoiced happily that St. Peter was free of sins. thus spoke the Lord Jesus: Why are you standing in front of me? Looking so sad and weeping. Oh, come and have pity on me. You, who have violated the ten commandments, fall to your knees and pray to God! Love only God at all times, and you will receive the heavenly joy! The heavenly joy, never ending. Through Jesus and as a blessing for all. Out of the embers of the previous movement, unfolds the most beautiful, tender, loving melody, as befits the title Mahler gave the 23-minute last movement of the symphony, ‘What love tells me’. The opening string melody bears a thematic resemblance to the very opening of the symphony, and quickly gives way to a second idea: a rising phrase presented by the cellos, the ascent of which becomes important later in the movement. It is not long before accented notes punctuate the gossamer texture, hinting at pain amongst the beauty. Moving through a variety of different keys, Mahler varies the opening material, develops and pushes it forward into passionate outbursts, each one descending into a crisis of ever-increasing intensity. Mahler does this four times, and with every instance the dream of true love becomes closer, only to be dashed away. After the last crisis, all that is left of love’s fire is a fragile flute solo, which gives way to an even more tentative piccolo. A choir of brass instruments, led by the trumpets, reprises the opening theme one more time, supported by gentle trombones. Their reassuring tone inspires the ascending cello phrase to take us slowly but inexorably towards our goal. Emboldened, the full orchestra sings joyfully as the climb continues. After the climax, there is a brief moment of calm reflection, perhaps of quiet gratitude, before the room is filled with with rich sounds of a love that surrounds and completes us, and the symphony. It’s a perennial dilemma, is it not. Of course, every member of the audience is starting in a different place; for those not familiar with Mahler’s style and approach, it might be helpful to have some basic contextual information, some hint as to what to expect. I think the key point about the length is important for listeners to pace themselves. For others the experience of hearing the music will raise questions – which could be answered in the programme notes (they are not necessarily meant to be read only beforehand!). For those who might already be familiar with the piece, or at least Mahler in general, some more detail, some snippets they might not already know, can be welcome. I’ve seen programme notes that concentrate on biographical info about the particular time in the composer’s life at the time of the composition, or first performance; circumstantial stuff about the triggers for writing (a commission, or interest in a specific performer for example). I’m an analysis junkie so I love programme notes that point out musical links between themes and show the way the music develops and hangs together, thematically and harmonically, but I appreciate that not everyone wants to read about that in a programme. One answer to all this is to provide a kind of “reading list” of books or internet links that people can turn to if they want to know more. Yep, that sums it up very nicely, Andy. The final programme note is slightly-altered from the one above. I’m about to post up the listening notes, too. And hopefully later this week, there’ll be a post about the challenges (and rewards!) of listening to a long piece of music like the Mahler, so your pacing point is well-made!